Dr. Gary Trupo has been in practice since 1994. He has practiced in Virginia, Maryland, Delaware and Florida. He opened CHIRO & LASER Pain Relief Center of St. Augustine to support the health of our community with chiropractic care and laser pain relief therapy. It’s our goal to get you better quickly with affordable and convenient care. With a range of solutions available, we’ll combine them to get you the best possible results. We see people with problems such as back and neck injuries, plantar fasciitis, sciatica, carpal tunnel syndrome and more musculoskeletal-related issues. We’ll work to relieve your pain, rehabilitate your condition and get you back to functioning normally. 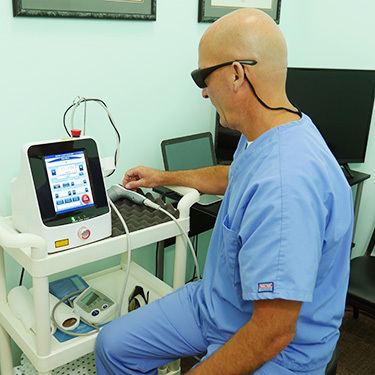 Our laser pain relief therapy is appropriate for nearly anyone. Dr. Gary has been using it for years and understands how it works hand in hand with chiropractic to help you heal at an unprecedented rate. The laser assists the soft tissues of the body to heal through painless, noninvasive therapy. If you’re ready to get started, take advantage of our $29 new patient special. It includes a consultation, examination and first treatment. Contact our chiropractic care center today to schedule your appointment!